The official Home of Football. Every football fan should make a pilgrimage here to shake the club warmly by the hand for giving us the game we love today. The ground isn’t actually in Sheffield – heck, it’s not even in Yorkshire but who cares when you have the best pub in the world (The Coach and Horses) next door which has 6 (SIX) Thornbridge beers on tap and some superb food. You could spend hours scanning the “members” wall which includes such luminaries as Sepp Blatter, Jack Warner and Def Leppard. The football is in someway secondary to a great afternoon out, thinking about what we would have been doing if Sheffield FC had given up on their dreams. Close your eyes and imagine the scene. It’s mid-August, the sun is shining, you have your best shorts on and a free afternoon. What else could you want? A beer? Well how about some local Arundel Gold Ale? A backdrop to the game? One of the most beautiful castles in England? Oh, go on then. Arundel’s Mill Road ground is simply picture postcard perfect. It’s hard to concentrate on the game with such a backdrop and worth the admission alone. Have I mentioned the beer? Ah ok.
Once in a while you stumble on a ground that just leaves you wanting more. The Guldensporenstadion doesn’t tick any boxes when you look at it on paper. The club have been mid-table fodder in Belgium for years, the stadium has a modest capacity with little redevelopment in recent years. 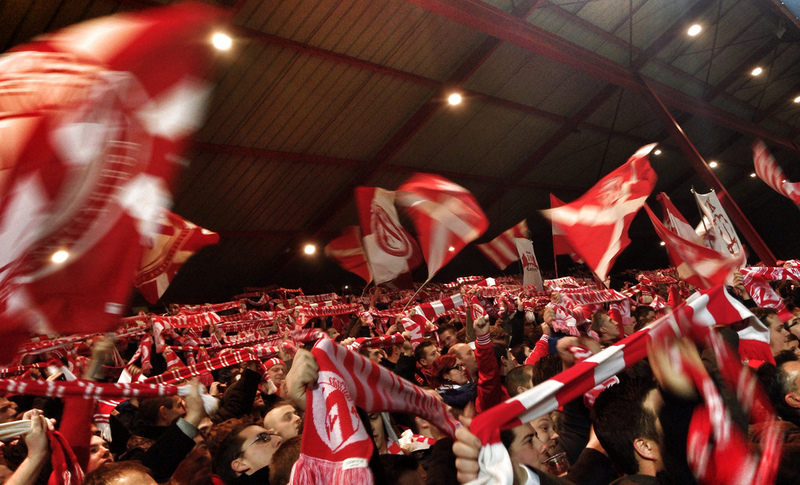 But come to the “Battle of the Golden Spurs” stadion on a big match day you will never want to go anywhere else. It has the lot. A huge covered terrace where the very vocal fans wave flags, twirl scarves and basically sing their hearts out. A hulking old main stand that looked like it had been transported from Swindon Town. Add in some of the best football food, top class Belgium beer and you cannot fail to fall in love with both KVK and the Guldensporenstadion. This entry was posted in Non league football and tagged twelve days of Christmas. Bookmark the permalink.